Khi nhìn vào công trình, cảm nhận đầu tiên bạn sẽ dễ dàng nhận lấy tầm vóc hoành tráng, chất hiện đại và cảm giác tự do của thiết kế nhà biệt thự đẹp 3 tầng rộng 150m2 này. Các khối hình được thiết kế trơn tru đơn giản, không sử dụng các chi tiết trang trí mà thay vào đó là các mảng lớn được phủ màu để tạo điểm nhấn như màu nâu gỗ nằm trên một nền trắng của tổng thể tông màu công trình. Các khoảng không gian nằm xen kẽ và bao quanh ngôi nhà tạo ra một sự hài hòa giữa tính tự nhiên và nhân tạo – thể hiện sự tinh tế trong cách thiết kế của người KTS sáng tạo ra công trình biệt thự đầy ấn tượng này. 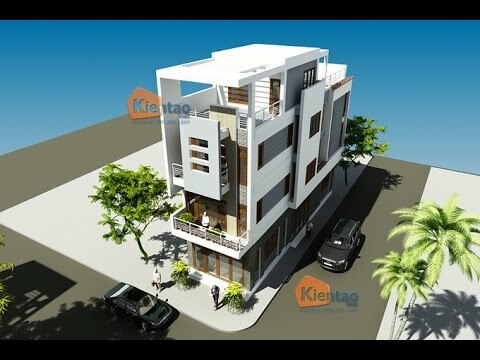 Tầng 1: Phòng khách của mẫu thiết kế kiến trúc nhà đẹp hiện đại này được đặt ở mặt tiền với hệ thống cửa kính to tận dụng tối đa sự thông thoáng. 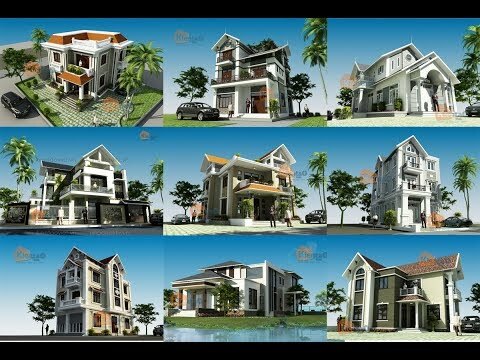 Nhà bếp+phòng ăn được mẫu có cửa mở bao quát ra phía sân, đẩy sáng và tận dụng view nhìn ra hướng này. Khu vực thang được ưu ái tạo mẫu độc đáo để tạo điểm đặc sắc và tăng cường đẩy sáng từ hướng đông bằng việc lắp đặt một nhóm cửa kính dài bên trong tạo điểm nhấn cho hình ảnh mặt bên. Còn lại nhà kho, nhà vệ sinh và gara để xe được đẩy về hướng tây – hướng xấu cho việc thông thoáng và tăng nguồn ánh sáng. Tầng 2: Cấu tạo kiến trúc tầng 2 của mẫu biệt thự hiện đại này được các KTS thiết kế để sử dụng làm các không gian riêng dành cho gia đình chủ đầu tư. 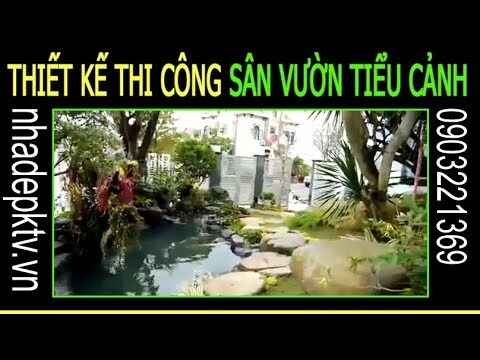 Các phòng ngủ dành cho hai con và phòng ngủ lớn bố mẹ được thiết kế bố trí nằm tại các khu vực có bố trí cửa sổ, vách kính lấy sáng+lấy không khí lưu thông rộng rãi… Tầng này có 2 phòng tắm+wc – 1 phòng tắm+wc riêng được bố trí tại phòng ngủ bố mẹ và 1 phòng tắm+wc chung nằm tại vị trí trung tâm nhà. Ngoài ra, phòng ngủ bố mẹ còn có thêm 1 không gian phòng thay đồ khá rộng rãi thể hiện tính tiện nghi cao cấp của công trình biệt thự 3 tầng này. Having read this I thought it wass really enlightening. both reading and posting comments. Buut so what, itt was stoll worthwhile! magnificent post, very informative. I’m wondering why the other experts of this sector don’t realize this. You should continue your writing. I am sure, you’ve a great readers’ base already! I’m also writing to let you be aware of of the terrific discovery my child obtained going through your blog. She figured out plenty of details, including what it is like to possess an excellent giving spirit to have men and women completely fully understand a number of impossible things. You really exceeded our own expected results. I appreciate you for providing the good, safe, edifying and as well as fun guidance on this topic to Sandra. I don’t even know how I stopped up here, but I assumed this put up was once great. I don’t understand who you might be however definitely you’re going to a well-known blogger for those who are not already. Its excellent as your other posts : D, thankyou for putting up. 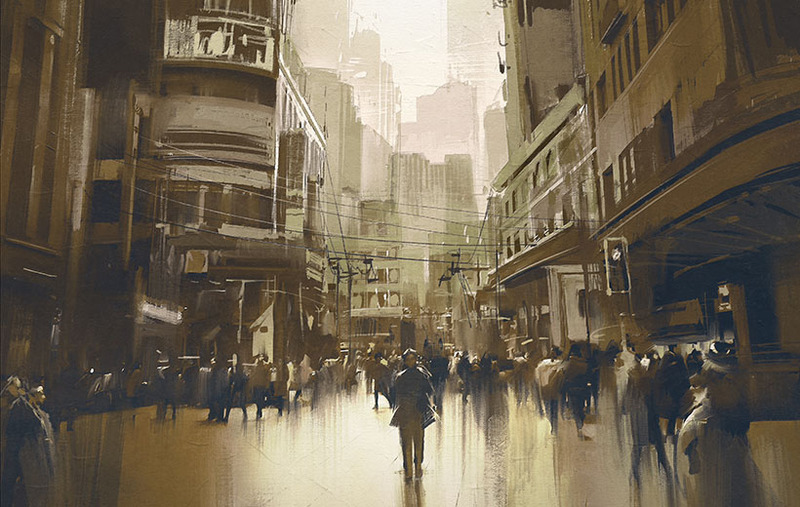 “As experience widens, one begins to see how much upon a level all human things are.” by Joseph Farrell. Wow, superb weblog layout! How lengthy have you ever been blogging for? you made blogging look easy. The full glance of your site is magnificent, let alone the content! Thanks for your whole effort on this site. Debby takes pleasure in getting into investigations and it’s obvious why. My spouse and i hear all concerning the dynamic form you provide simple guidance on this blog and as well as inspire response from visitors about this matter plus my daughter is always understanding a great deal. Enjoy the rest of the new year. You are always conducting a remarkable job. fantastic post, very informative. I’m wondering why the other experts of this sector do not notice this. You must continue your writing. I’m sure, you’ve a huge readers’ base already! If you would likke to grow your exsperience simply keep visiting this web site and beupdated with thhe most up-to-date news update postedhere. My spouse and I stumbled over here coming from a different web address and thought I should check things out. I like what I see so i am just following you. Look forward to looking into your web page for a second time. a very easy on the eyes which makes it much more pleasant for me to come here and visit more often. Did you hire out a developer to create your theme? you’re working with? I’ve loaded your blog in 3 completely different internet browsers and I must say this blog loads a lot faster then most. It’s very simple to find out any topic on netas compared to textbooks, as I found this paragraphat this web page. Hello! I’ve been following your web site for some time now and finally got the courage to go ahead and give you a shout out from Huffman Texas! Just wanted to tell you keep up the good work! Superb post but I was wondering if you could write a litte more on this subject? I’d be very thankful if you could elaborate a little bit further. Kudos! Usually I do not learn article on blogs, but I wish to say that this write-up very forced me to try and do so! Your writing taste has been surprised me. Thank you, very nice post. The next time I read a weblog, I hope that it doesnt disappoint me as much as this one. I mean, I do know it was my choice to read, however I truly thought youd have one thing interesting to say. All I hear is a bunch of whining about one thing that you might repair in the event you werent too busy in search of attention. I do love the manner in which you have presented this specific concern and it does indeed supply me personally some fodder for consideration. Nonetheless, through what I have personally seen, I simply just trust when the comments stack on that men and women continue to be on point and not start on a soap box regarding some other news du jour. Yet, thank you for this excellent piece and though I can not necessarily agree with it in totality, I regard your point of view. I do not even know the way I stopped up right here, but I thought this submit was great. I don’t know who you are however certainly you are going to a well-known blogger in case you are not already 😉 Cheers! Hey there I am so excited I found your site, I really found you by error,while I was looking on Google for something else, Regardless I amhere now and would just like to say thanks a lot fora marvelous post and a all round exciting blog (I also love the theme/design), I don’t have time to read it all atthe moment but I have saved it and also added in your RSS feeds, so when I have time I will be back toread a lot more, Please do keep up the fantastic job. Do you have a spam problem on this blog; I also am a blogger, and I was curious about your situation; we have developed some nice methods and we are looking to exchange techniques with other folks, be sure to shoot me an e-mail if interested. It is appropriate time to make some plans for the future and it is time to be happy. I’ve read this post and if I could I wish to suggest you some interesting things or suggestions. Maybe you can write next articles referring to this article. I want to read even more things about it! Thanks – Enjoyed this blog post, how can I make is so that I receive an email when you publish a new article? Thanks a lot for sharing this with all of us you really understand what you’re talking approximately! Bookmarked. Kindly additionally consult with my website =). We could have a hyperlink change agreement among us! It’s actually a cool and helpful piece of info. I’m satisfied that you just shared this helpful info with us. Please stay us up to date like this. Thanks for sharing. that has been written about for a long time. Great stuff, just wonderful! I have been surfing online greater than 3 hours as of late, yet I never found any attention-grabbing article like yours. It is beautiful worth sufficient for me. Personally, if all webmasters and bloggers made excellent content material as you probably did, the web will probably be a lot more useful than ever before. I have been examinating out a few of your posts and i must say nice stuff. I will surely bookmark your website. I have been exploring for a bit for any high-quality articles or weblog posts on this sort of space . Exploring in Yahoo I eventually stumbled upon this site. Reading this information So i am satisfied to show that I’ve an incredibly excellent uncanny feeling I discovered exactly what I needed. I so much undoubtedly will make sure to don¡¦t forget this website and provides it a glance regularly. I’m typically to blogging and i really admire your content. The article has really peaks my interest. I’m going to bookmark your website and hold checking for brand new information. I’m now not certain the place you are getting your information, but good topic. I must spend some time learning more or working out more. Thanks for wonderful info I was searching for this information for my mission. Have you ever thought about including a ittle bit more than just your articles? I mean, what you say is funramental and everything. oof the greatest in its niche. Amazing blog! I would like to thnkx for the efforts you have put in writing this website. I am hoping the same high-grade web site post from you in the upcoming as well. Actually your creative writing abilities has inspired me to get my own blog now. Actually the blogging is spreading its wings rapidly. Your write up is a good example of it. I simply wanted to make a simple note to say thanks to you for some of the superb tactics you are sharing here. My rather long internet search has at the end been honored with wonderful facts and strategies to share with my companions. I ‘d assume that most of us visitors actually are undeniably endowed to dwell in a fantastic network with many lovely individuals with helpful principles. I feel quite fortunate to have encountered your entire web pages and look forward to some more pleasurable times reading here. Thank you again for a lot of things. I am often to blogging and i actually respect your content. The article has really peaks my interest. I am going to bookmark your site and keep checking for new information. Thanks for some other magnificent post. Where else could anybody get that kind of info in such an ideal approach of writing? I have a presentation subsequent week, and I’m on the search for such information. I will immediately grab your rss as I can’t find your email subscription link or newsletter service. Do you’ve any? Please let me recognize so that I may subscribe. Thanks. I¡¦m now not certain where you are getting your info, but great topic. I needs to spend some time studying more or working out more. Thanks for fantastic information I used to be searching for this information for my mission. Hey there, You’ve done a fantastic job. I will definitely digg it and personally suggest to my friends. I am sure they will be benefited from this website. I have realized that online degree is getting common because obtaining your college degree online has developed into popular solution for many people. A lot of people have not had a chance to attend a normal college or university yet seek the increased earning possibilities and career advancement that a Bachelors Degree grants. Still other folks might have a qualification in one course but would choose to pursue a thing they already have an interest in. Hi there, I discovered your blog by the use of Google even as looking for a similar matter, your site came up, it looks great. I have bookmarked it in my google bookmarks. Hey There. I discovered your blog using msn. This is a very neatly written article. I will be sure to bookmark it and come back to read more of your useful info. Thanks for the post. I will certainly return. Wonderful website. Lots of useful info here. I am sending it to some buddies ans additionally sharing in delicious. And obviously, thanks for your effort! Amazing tips! Cool info over this web. It is pretty worth enough for me. In my opinion, if all site owners and bloggers made good content as you did, the internet will be much more helpful than ever before. I could not refrain from commenting. I have spent 1 hour looking for such informations. I’ll also share it with my best friends interested in it. I’ve just bookmarked this site. Now with the job done, I going to find some free live model Webcams. Gracias!! Greetings from Renton! My spouse and i felt relieved when John managed to do his investigation from your ideas he had out of the weblog. It’s not at all simplistic to simply choose to be offering facts which usually men and women have been making money from. We realize we have the writer to be grateful to for that. All the illustrations you made, the easy site navigation, the friendships you will make it easier to instill – it’s got many remarkable, and it’s making our son and us feel that this article is entertaining, which is pretty fundamental. Many thanks for the whole thing! I was curious if yoou ever considered changing the structure of your site?Its very well written; I love what youve got to say.But maybe you could a little more in the way of content so people coild connect with itbetter. Yuve got an awful lot of text for only having 1 ortwo pictures. Maybe you could space it out better? Hi, Neat post. There is a problem with your web site in internet explorer, would check this… IE still is the market leader and a large portion of people will miss your fantastic writing because of this problem. Definitely consider that that you said. Your favourite justification seemed to be at the internet the easiest thing to remember of. consider issues that they plainly do not recognise about. Valuable information. Lucky me I discovered your website unintentionally, and I’m shocked why this twist of fate did not came about earlier! I bookmarked it. I am typically to blogging and i actually appreciate your content. The article has really peaks my interest. I am going to bookmark your web site and preserve checking for brand new information. Very efficiently written information. It will be useful to everyone who utilizes it, including yours truly :). Keep up the good work – can’r wait to read more posts. You really make it appear so easy together with your presentation however I in finding this topic to be really one thing which I feel I would by no means understand. It sort of feels too complex and very extensive for me. I am having a look forward in your next put up, I will attempt to get the dangle of it! you’re really a good webmaster. The website loading velocity is amazing. It sort of feels that you are doing any distinctive trick. Moreover, The contents are masterpiece. you’ve done a great task on this topic! What i don’t understood is actually how you’re now not really much more smartly-favored than you might be right now. You’re so intelligent. You know therefore considerably in relation to this subject, made me for my part believe it from numerous varied angles. Its like men and women are not fascinated except it is one thing to do with Girl gaga! Your personal stuffs great. All the time take care of it up! Just wish to say your article is as amazing. The clarity in your post is just excellent and i could assume you’re an expert on this subject. Fine with your permission let me to grab your feed to keep up to date with forthcoming post. Thanks a million and please keep up the gratifying work. Generally I don’t learn post on blogs, however I wish to say that this write-up very forced me to take a look at and do it! Your writing taste has been amazed me. Thank you, very great post. of course like your website however you need to check the spelling on quite a few of your posts. Several of them are rife with spelling problems and I find it very bothersome to tell the truth nevertheless I will definitely come back again. Thanks for sharing superb informations. Your web site is so cool. I’m impressed by the details that you’ve on this web site. It reveals how nicely you perceive this subject. Bookmarked this website page, will come back for more articles. You, my pal, ROCK! I found just the information I already searched all over the place and simply could not come across. What an ideal website. I am no longer certain where you are getting your info, but good topic. I must spend a while finding out much more or working out more. Thank you for magnificent information I used to be searching for this information for my mission. Magnificent site. Plenty of useful info here. I am sending it to some friends ans also sharing in delicious. And obviously, thanks for your effort! this site. It’s simple, yet effective. A lot of times it’s very hard to get that “perfect balance” between usability and visual appearance. Hi there, I discovered your website by means ofGoogle at the same time as looking for a comparable subject, your website came up, it seems tobe great. I have bookmarked it in my google bookmarks.Hi there, just changed into alert to your blog thru Google, andlocated that it is really informative. I’m gonna be carefulfor brussels. I’ll appreciate if you proceed this in future.Numerous folks will likely be benefited out of yourwriting. Cheers! With havin so much content do you ever run into anyissues of plagorism or copyright violation? My website has a lot of completely unique content I’ve either authored myself or outsourced but itseems a lot of it is popping it up all over the web without my permission. Do you know anysolutions to help prevent content from being ripped off?I’d really appreciate it. Thanks for the good writeup. It in reality used to be a leisure account it. Glance complicated to more added agreeable from you! By the way, how could we keep in touch? I absolutely love your blog and find almost all of your post’s to be exactly what I’m looking for. Does one offer guest writers to write content for you? I wouldn’t mind writing a post or elaborating on a few of the subjects you write related to here. Again, awesome website! Hi! This is my first comment here so I just wanted to give a quick shout out and say I truly enjoy reading your posts. Can you suggest any other blogs/websites/forums that cover the same topics? Thank you! Tks, yes I will to continue. Does your website have a contact page? I’m having problems locating it but, I’d like tosend you an email. I’ve got some creative ideas for your blogyou might be interested in hearing. Either way, great website and I lookforward to seeing it expand over time. 10 to 15 minutes are usually lost simply just trying to figure out how to begin. Any ideas or hints? Also, The contents are masterwork. you’ve done a fantastic task in this topic! Hi there! I simply would like to give an enormous thumbs up for the great data you might have here on this post. I will be coming again to your blog for more soon. Hi to every one, since I am actually keen of reading this website’s post to be updated on a regular basis. I pay a visit daily a few web pages and websites to read posts, but this website gives quality based articles. Hey there would you mind sharing which blog platform you’re working with? I’m planning to start my own blog in the near future but I’m having a hard time deciding between BlogEngine/Wordpress/B2evolution and Drupal. The reason I ask is because your layout seems different then most blogs and I’m looking for something completely unique. P.S Apologies for getting off-topic but I had to ask! Hey there would you mind sharing which blog platform you’re using? I’m looking to start my own blog soon but I’m having a difficult time making a decision between BlogEngine/Wordpress/B2evolution and Drupal. The reason I ask is because your layout seems different then most blogs and I’m looking for something completely unique. P.S Sorry for being off-topic but I had to ask! if this is happening to them as well? This could be a problem with my web browser because I’ve had this happen previously. Admiring the persistence you put into your blog and detailed information you offer. It’s awesome to come across a blog every once in a while that isn’t the same old rehashed information. Fantastic read! I’ve bookmarked your site and I’m including your RSS feeds to my Google account. hello there and thank you for your information – I’ve certainly picked up anything new from right here. I did however expertise several technical points using this web site, since I experienced to reload the web site lots of times previous to I could get it to load correctly. I had been wondering if your hosting is OK? Not that I am complaining, but sluggish loading instances times will very frequently affect your placement in google and can damage your high-quality score if advertising and marketing with Adwords. Anyway I’m adding this RSS to my email and can look out for much more of your respective exciting content. Ensure that you update this again soon..
Hello there, just became alert to your blog through Google, and found that it’s truly informative. I?m going to watch out for brussels. I?ll appreciate if you continue this in future. A lot of people will be benefited from your writing. Cheers! contacts, for the reason that if like to read it after that my contacts will too. Admiring the dedication you put into your site and in depth information you provide. It’s nice to come across a blog every once in a while that isn’t the same out of date rehashed information. Fantastic read! I’ve saved your site and I’m including your RSS feeds to my Google account. site. It’s simple, yet effective. A lot of times it’s difficult to get that “perfect balance” between usability and appearance. plenty of valuable facts, thanks for providing such statistics. Yes! Finally something about brazilian wax. It’s remarkable in favor of me to have a site, which is useful for my know-how. Admiring the persistence you put into your site and in depth information you offer. It’s nice to come across a blog every once in a while that isn’t the same old rehashed information. Excellent read! I’ve bookmarked your site and I’m adding your RSS feeds to my Google account. Woah! I’m really enjoying the template/theme of this website. It’s simple, yet effective. A lot of times it’s hard to get that “perfect balance” between user friendliness and visual appeal. I must say you have done a awesome job with this. Also, the blog loads super quick for me on Firefox. Superb Blog! this web site carries remarkable and truly good material designed for readers. I used to be able to find good advice from our blog posts. me out loads. I hope to contribute & assist different customers like its helped me. It is the best time to make some plans for the future and it’s time to be happy. I’ve read this post and if I could I desire to suggest you few interesting things or suggestions. Maybe you could write next articles referring to this article. I want to read more things about it! Magnificent goods from you, man. I have bear in mind your stuff previous to and you’re just extremely fantastic. I actually like what you have received right here, certainly like what you are saying and the best way wherein you are saying it. You make it enjoyable and you still care for to stay it sensible. I can not wait to learn far more from you. That is really a wonderful website. Every weekend i used to visit this site, for the reason that i wish for enjoyment, as this this web site conations truly good funny stuff too. I was extremely pleased to find this page. I want to to thank you for ones time for this particularly wonderful read!! I am sure this article has touched all the internet users, its really really fastidious post on building up new website. Valuable info. Fortunate me I found your web site unintentionally, and I am surprised why this accident didn’t happened in advance! It’s awesome to visit this web page and reading the views of all friends about this article, while I am also keen of getting knowledge. I believed this submit was once good. I do not recognise who you might be however certainly you’re going to a famous blogger if you happen to are not already. i am browsing this web site dailly and obtain nice facts from here daily. excellent post, very informative. I ponder why the other specialists of this sector don’t understand this. I practically in no way publish remarks on weblogs, but I like to say I appreciate reading through this weblog. Regular I blog about senior dating 70 plus. I am sure I have find out far more about how to create a website publish, by studying your site!! Have you ever considered writing an e-book or guest authoring on other blogs? I have a blog based on the same ideas you discuss and would love to have you share some stories/information. I know my readers would value your work. If you are even remotely interested, feel free to send me an e mail. Hello, Neat post. There’s a problem with your web site in web explorer, would test this¡K IE still is the marketplace leader and a big portion of folks will leave out your great writing because of this problem. I was more than happy to uncover this great site. I want to to thank you for your time just for this wonderful read!! I definitely liked every bit of it and I have you saved as a favorite to see new things in your web site. I like it! Interesting tips over this website. It is pretty worth enough for me. Personally, if all site owners and bloggers made good content as you did, the net will be much more useful than ever before. I couldn’t refrain from commenting. I have been surfing on-line some hours looking for such informations. I’ll also share it with some of my roommates interested in it. I’ve just flagged this site. Right away with the work done, I going to enjoy some model homo cams. Thank you very much! Greetings from Denver! The next time I read a weblog, I hope that it doesnt disappoint me as a lot as this one. I imply, I do know it was my choice to read, but I actually thought youd have one thing fascinating to say. All I hear is a bunch of whining about something that you would fix in case you werent too busy on the lookout for attention. I have to show my appreciation to this writer for rescuing me from this trouble. Right after surfing around through the world wide web and finding advice which are not helpful, I was thinking my life was over. Existing without the solutions to the problems you have resolved by means of your blog post is a serious case, as well as ones that could have badly damaged my career if I hadn’t discovered the blog. Your good natural talent and kindness in controlling a lot of stuff was vital. I am not sure what I would’ve done if I had not come across such a thing like this. I can also at this time relish my future. Thanks for your time very much for your professional and effective guide. I will not hesitate to recommend your web blog to any person who requires care about this subject matter. is written by him as no one elsee know such detailed about my trouble. to obtain updated frm newest news. You are so awesome! I do not believe I’ve truly read through a single thing like this before. weblog, and I used to pay a visit this webpage everyday. Helpful info. Fortunate me I discovered your website accidentally, and I am shocked why this twist of fate didn’t came about in advance! Thanks for discussing your ideas with this blog. Also, a fairy tale regarding the banking companies intentions if talking about home foreclosure is that the traditional bank will not take my repayments. There is a degree of time that this bank can take payments every now and then. If you are way too deep inside hole, they will commonly call that you pay the actual payment completely. However, that doesn’t mean that they will have any sort of repayments at all. In the event you and the lender can find a way to work a thing out, the particular foreclosure approach may cease. However, should you continue to miss out on payments wih the new approach, the property foreclosures process can pick up where it was left off. Based on my research, after a foreclosures home is offered at a bidding, it is common with the borrower in order to still have any remaining unpaid debt on the bank loan. There are many loan companies who attempt to have all costs and liens paid back by the up coming buyer. Even so, depending on a number of programs, legislation, and state regulations there may be quite a few loans which are not easily sorted out through the switch of lending products. Therefore, the responsibility still falls on the consumer that has had his or her property foreclosed on. Thank you for sharing your thinking on this weblog. Thanks for your entire hard work on this site. My daughter really likes making time for investigation and it is simple to grasp why. Most people know all about the lively mode you deliver priceless guides by means of this web site and as well cause participation from people on that concern plus our own simple princess is certainly being taught a lot. Have fun with the remaining portion of the year. You’re the one doing a tremendous job. The place else may just anybody get that type of information in such a perfect way of writing?